It's time to Dazzle & strut your stuff! Relive the movie – get in drag & walk up the main drag of this country town. It’s our very own Country Mardi Gras. The Parade starts at the Post office and walks to Cnr Oxide/Argent and back to town Square. 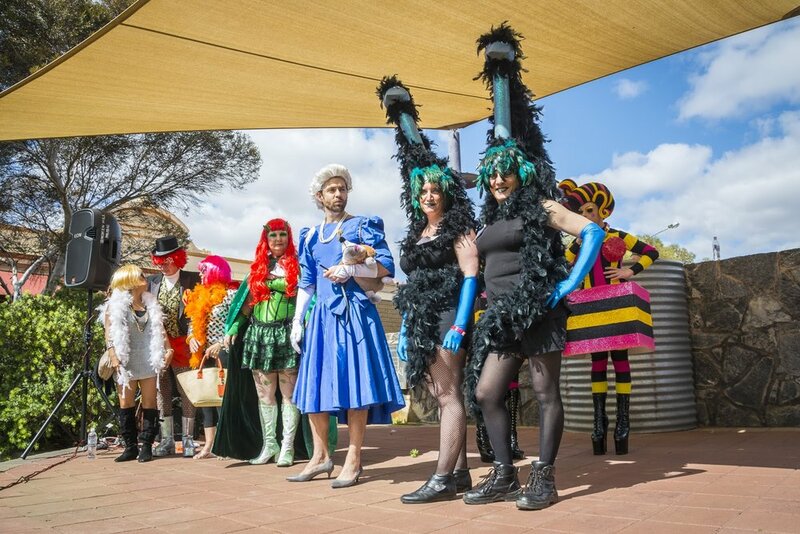 Join in family friendly games in the Town Square including our favourite handbag toss and enter the best Priscilla inspired outfit competition for a chance to win a GRAND PRIZE! To register, roll up at the parade, sign on in the Town Square from midday. Watch the presentation of the Shoestring budget heat for contestants in the So You Think You Can Drag competition running over the festival weekend. Prizes & laughs a plenty. Entertainment by Philmah Bocks, Art Simone, Maude Boat, Leather Lungs, Anita, Kita and Shelita Handful. 2DryFM 107.7 Broadcasting the happenings live! Please note traffic restrictions in place, please expect delays. Everyone welcome to join the parade. Please give clearance to parade vehicles.